It might seem that Seán O'Brien has done nearly everything in his sport but when he takes to the field against Benetton on Saturday, he will surpass a significant personal milestone. For the upcoming PRO14 clash will mark the fifth successive weekend he will have taken to the field and, all hope, will remove himself from it in one piece. If anything suggests his renewed strength and fitness after a horrendous run of injuries, then such a sustained run of activity bodes well. Not since 2012 has he strung four consecutive games together, either because of player management or injury, and there have been large swathes of inactivity during that time, with successive surgeries threatening to end his career. 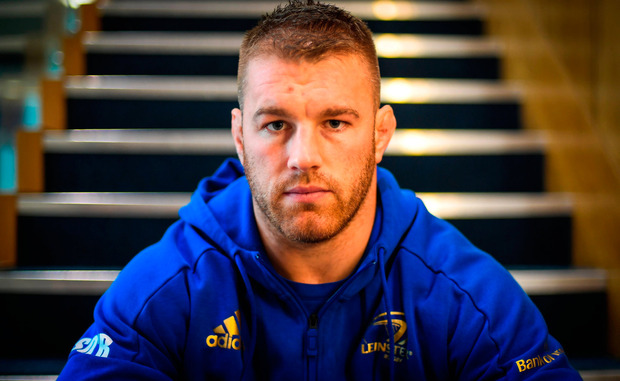 But, he's still standing and adding significant contributions in Leinster blue as he seeks to reclaim his place in Ireland green next month. "I'm happy with my progress," says the flanker. "Last weekend was another step up again. I did some good things, but then some poor things that just weren't sharp enough. Other than that, I'm going in the right direction. It's about getting time." Like any decent thoroughbreds born to the turf, O'Brien's strength derives from sustained time spent on the track. Back in 2012 he clocked in 1,900 minutes during a stellar campaign for club and country, dipping to just over 1,000 a season later. Since then, he has never managed to breach four figures. He's on 202 minutes this term. And counting. "Sure I'm on the way now! I definitely want to keep playing." A sixth sense - always difficult when second-guessing Joe Schmidt - might surmise that his availability this week will remove him from the Italian game in Chicago and instead prime him for the significant November Test against Argentina. And, of course, the All Blacks; O'Brien didn't make the Chicago cut but his significance on the Lions tour elevated his status in the land of the long white cloud. And while O'Brien's injury woes appear to be behind him, McFadden faces an anxious future as he awaits a specialist opinion after a high-grade hamstring tear in training. The 32-year-old international faces a lengthy spell on the sidelines regardless of this week's medical advice which will dent his chances of making an Ireland impression ahead of next year's World Cup. The injury is not believed to be season-ending but the chances of him making a full recovery by the end of this year are not at all certain. "It's similar to how he was injured in the Scarlets game, scoring the try, he got the same strain," confirmed Stuart Lancaster. "He's got to see a specialist and we'll get an assessment then. It won't be two weeks, that's for sure." Dave Kearney has also been ruled out of Saturday's game against Benetton after suffering an abductor strain in training. Dan Leavy (calf) and Rob Kearney (quad) are due to return to full training this week with a view to being available for the trip to Italy. Josh van der Flier has entered the graduated return-to-play protocols after being withdrawn with a head injury during Sunday's defeat to Toulouse.